One of a Kind Penthouse Residence is Available. Never before offered for sale! Here&apos;s your opportunity to own this unique property. 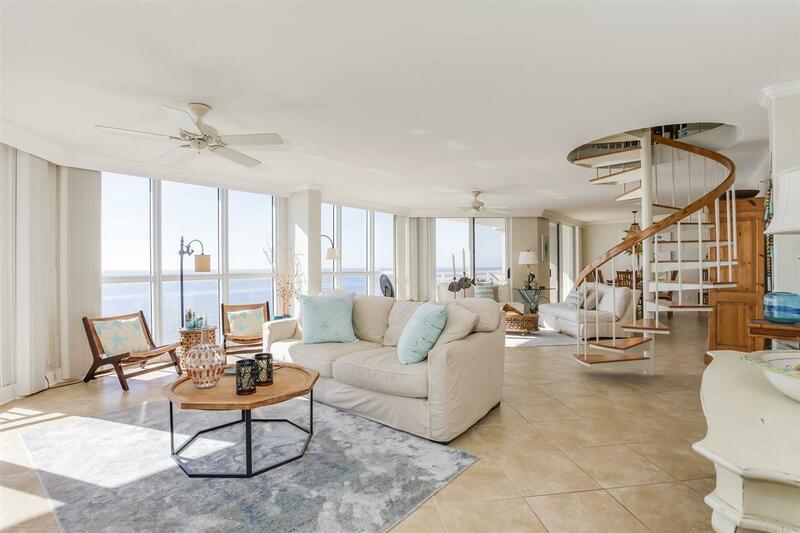 This 4 bed/4 bath unit is like no other in Seaspray! When you exit the elevator, you will notice the expansive views of the River & the Intracoastal. As you enter the Penthouse, you will notice the large walk in storage closet for all your Beach Toys. On the East Wing of the unit, there is a large bedroom which features 2 queen beds & a full private bath attached. Next you will be amazed at the Large Master Suite with a Private Balcony overlooking the Gulf. This room features a large walk in closet, private bath with stone shower! Also, in the East Hallway is a wet bar complete with Granite counter & Ice Machine. Next your breath will be taken away by the Large Open Concept Living Area Complete with Fireplace, built ins, Balcony & Large Dining Area. You will also notice a Spiral Staircase that leads you to another Entertaining Space Upstairs complete with wet bar & built in Mini Fridge. The views from this room are Breathtaking! There are doors here that lead to a private SUN DECK ON THE ROOF! No other Seaspray Unit has this Entertaining Space. Penthouse Living at it&apos;s Finest!!! Back on the Main Floor, you will be amazed at the large, open kitchen. There are Granite Counters, Stainless Steel & Completely Stocked Kitchen. The West Hall features ANOTHER MASTER SUITE with it&apos;s own bath, walk in closet, & King Bed. There is a 4th Bedroom w/two Twin Beds & a Private Bath. Seaspray features 3 Pools, one of which is an Infinity Pool, a hot tub, Work Out Room that is all Glass that Looks out to the Gulf! There is a Private Party Room that is available to the owners & under bldg parking in the East Bldg for Owners. There are Garages Available for Purchase from time to time & THE BEST PART - There is a Boat Dock & Slips Available & a nice pier for Sunsets! AMENITIES ON BOTH SIDES! CALL TODAY FOR YOUR SHOWING!